After awarding the elusive 5-star review to Ambassdor I – Seeing Red, I had high hopes for the second book in the series, and Patty Jansen delivered a book that did an admirable job of fulfilling them. 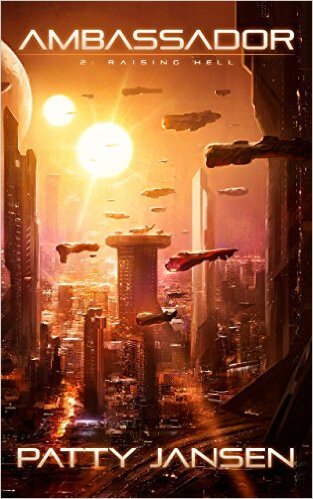 This is a 4-star review because Ambassador II lacks some of the mystery of the first book, and I didn’t burn pages quite as quickly, but I did go on a really fun ride, with ‘Delegate’ Cory Wilson as an increasingly enjoyable narrator. He still acts as a filter for the more interesting characters around him, but I’ve come to realise that’s the point: he’s as much of an ambassador to the reader as he is to gamra. Ambassador II has the hallmarks of enjoyable sci-fi (space craft journeys, firefights, peril on invented planets, interplanetary political tension, futuristic technology and mind to mind coms) but once again it’s the social sciences that hold the most interest, as the narrator gets deeper into the Coldi society and arrives at the kinds of cards he was never expecting to play. I’ll keep it all spoiler free, even though you’ve probably read book 1 if you’re reading this, but lets say it’s the dynamic between Cory Wilson and certain ‘associations’ that really make this story what it is. There’s a strong antagonist at the centre of this story, and plenty of working the tropes so that the opposition turn out to be more than what they seem. The situation of a man on a planet with an atmosphere his body can’t completely tolerate is a nice tension builder in itself, and the now familiar concept of Coldi language containing a LOT of different pronouns for different uses is still here. The fine tuning that Patty Jansen clearly did with Ambassador I is still here to enjoy. On the subject of the languages and nice sounding names that I praised book 1 for, I couldn’t help but smile when one character called ‘Rannu’ is introduced (probably unintentional on the author’s part, but it reminded me of ‘Rana’ – the Spanish word for frog.) For some reason I did start to have trouble keeping track of who was who, because there are so many guards introduced, and that many foreign names sometimes slowed my memory down, but that’s not really a criticism – I came to find it as much a part of the experience as I did with book 1. An interesting note with this book is that although there’s plenty of shoot-out style violence, there’s no real dwelling on the details of it. As a reader who often likes his action scenes brutal, messy and relentless perhaps I subconsciously marked this book down, but to be honest I didn’t mind a lack of descriptive writing, because the action was hard and fast and didn’t really need excessive detail. Where some other authors become simile machines, Patty Jansen keeps things nicely concise and pacey. This book reached a satisfying conclusion before planting the inevitable sequel bait for book 3, and that got my interest as one of the small mysteries that was present in this book was resolved. I look forward to the next book. Oh yeah, and the cover of this book looks awesome on an HD e-reader!